Underside of a Giant Isopod. Photo by R. Peyton Hale. On a recent night sample, there were gasps of both delight and horror when the ship’s fantail lights illuminated one of the samples. 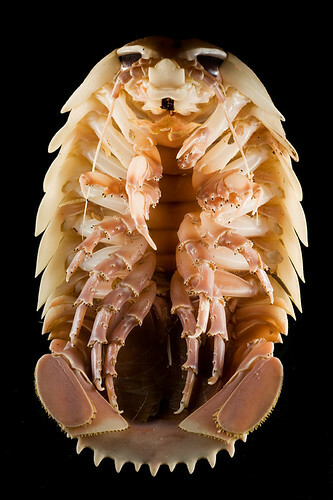 I was, unfortunately, already in my bunk and so missed it when they brought up a Bathynomus giganteus, a Giant Isopod. This thing looks like the stuff of horror movies to some, or nature in the extreme to us naturalist types. 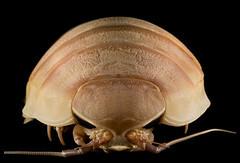 The Giant Isopod is related to the sow bugs so familiar to us back home (aka pill bugs, roly-poly, and many other common names), but it looks like a mechanical one on steroids. In fact, it doesn’t even look real and it reminds me of something we would sell at the Museum store during our annual BugFest event. But real it was. Ours was medium-sized, probably 8–10 inches in length and 4–5 inches wide (it might fit in a shoe box, maybe). I have read reports of some monsters reaching over 2 feet in length! A head-on view looks like a heavily armored vehicle in some sci-fi movie. Giant isopods have been found in depths from 200 to over 2000 m. They are believed to feed on dead whales, squid, fish and other material that fall into the depths in addition to devouring slow moving prey such as sea cucumber, sponges, and other creatures found on the deep-sea floor. Head-on view of a Giant Isopod. Photo by R. Peyton Hale. Females have a brood pouch, or marsupium, formed by overlapping plates on their underside. The fertilized eggs are huge — up to 0.5 inches — and are believed by some to be the largest eggs of any known marine invertebrate. Young are retained in the brood pouch until they emerge looking like miniatures of the adults (young isopods are known as mancae). 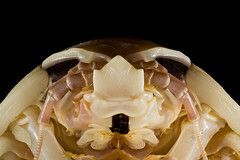 Head view of Giant Isopod, showing the compound eyes, each of which has an estimated 4000 facets. Photo by R. Peyton Hale. Giant isopods were first discovered in 1879 at a time when there was still debate whether there was life in the deep ocean. I can only imagine what stories must have been told about this seemingly alien creature from the depths back then if it evokes the variety responses I saw on board our ship the next day. And if, in its strange appeal, it garners interest in (and hopefully more awareness and concern for) these deep-sea environments from those that might not otherwise care, then the Giant Isopod is a worthy ambassador. Cutthroat eel. Photo by Art Howard. The dive site Thursday was a relatively shallow one for this mission (~250 m) but one that has been suspected to have species characteristic of greater depths. This may be explained by extremely cold water at this site — perhaps from upwelling of colder waters from deeper areas nearby — although no one knows for sure. 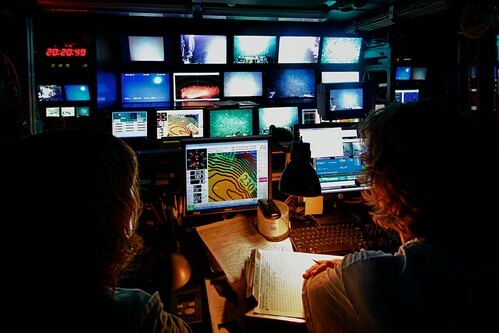 Indeed, the ROV recorded deep-water species such as Lophelia corals and several Cutthroat Eels. The eels were spotted near some coral and were moving about in their characteristic sinuous swimming motion, staying near the corals that were gently waving in the current. The scientists decided to collect them as we had not yet collected any fish on this mission. The method chosen to collect these slender fish was to use the ROV’s suction hose (aka slurp gun). The suction hose looks like a large dryer hose that you can find at your local home improvement store, but this one is attached to a multi-million dollar machine. To collect a specimen using the hose, the manipulator arm grabs a handle on the hose and directs it toward the intended specimen. 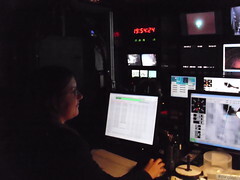 One of the crew inside the van pilots the arm while another controls the suction. When the time is right, the crew coordinate a giant gulp by Jason and the specimens are swept into a multi-chambered collection bucket monitored by a video camera. Inside the van, everyone can see whether the collection was successful. Cutthroat eel. Photo by R. Peyton Hale. The data is recorded and the specific collection bucket that the target was sucked into is logged and sealed. The collection bucket rack is then rotated so a fresh bucket is ready for the next specimen. The suction hose is quite useful for delicate specimens or for quick ones that are tough to grab with the manipulator arms. The eels are beautiful, bluish-silver in color, and range in size from 146-188 mm total length. Cutthroat eel head. Photo by Mike Dunn. Cutthroat eels are in a family of eels (Synaphobranchidae) found worldwide in temperate and tropical seas. 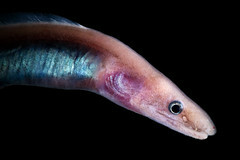 They are bottom-dwelling fish, found in deep waters down to about 3,700 meters (12,100 ft). The specimens collected during this mission will be taken back to the lab at UNCW as voucher specimens for this locale and habitat. Brittle star with one missing arm. Photo by Mike Dunn. Brittle stars are aptly named — when specimens are brought into the lab for us to photograph they are generally missing arms. We always get blamed, but our response always is, “they came to us that way, honest.” Seems their arms tend to fall off when touched by a scientist or grabbed by a predator. Brittle star arm. Photo by Art Howard. Brittle stars, or ophiuroids (ophis means snake in Greek), are echinoderms and are closely related to starfish. They crawl across the seafloor or in coral or rubble using their flexible arms for locomotion. The movement of their arms is indeed snake-like. They generally have five long, slender, whip-like arms, which may reach up to 24 inches in length on the largest specimens. Luckily for them, in spite of being fragile, ophiuroids can readily regenerate lost arms or arm segments. They use this ability to cast off an arm in a way similar to how some lizards deliberately shed part of their tails to escape and confuse predators. Some brittle stars are also able to emit a green light when disturbed. Each arm is supported by a central internal skeletal support (ossicle). 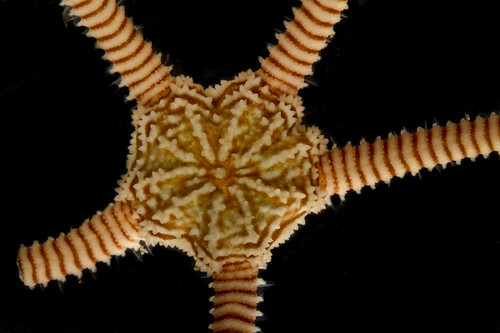 Like starfish, brittle stars have tube feet, but those of brittle stars lack suckers. The tube feet help more with feeding than with locomotion. Brittle star - underside of disk. Photo by Art Howard. The central disk of ophiuroids contains all of the internal organs of digestion and reproduction. So, unlike starfish, these organs are never found in the arms of brittle stars. Look closely at the underside of the disk. The star shape is from the five moveable jaw segments surrounding the mouth. Ophiuroids are generally scavengers or detritivores. 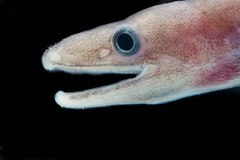 Small organic particles are moved into the mouth by the tube feet. They may also prey on small crustaceans or worms. The paired sacs between each arm are called bursae. These are the primary sites for gas exchange and excretion in brittle stars. In some species, the bursae are also used as brooding chambers for developing larvae. 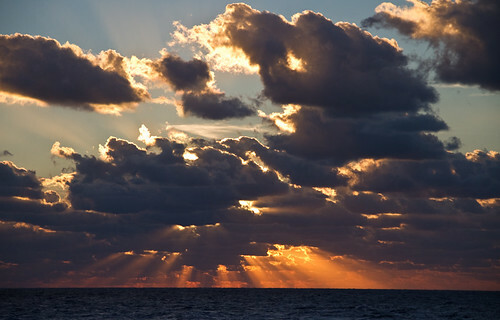 Another beautiful sunrise at sea. Photo by Mike Dunn. A couple of days ago it hit me how much time I had been spending in the confines of the main science lab. 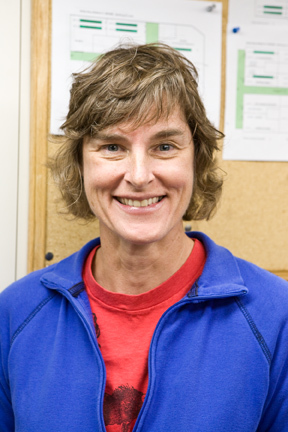 I have been in the lab almost constantly since arriving on the ship either photographing specimens or trying to write and post blogs through the temperamental Internet connection. I decided I need to get back in touch with who I really am- the guy that likes to walk in the woods, to observe nature. The logical thing was to go out on the deck, especially the bow of the ship. I remember before going on the Arctic research trip several years ago, someone asked me if I would get bored looking at ice all day. The answer was a resounding no. One of the scientists on board that trip explained it best — he compared it to watching a campfire, something that almost everyone seems to enjoy. It is mesmerizing, always changing. Time spent on deck here is similar…no day is the same weather-wise, no two waves alike — the weather, wind, and light are always changing. So, now I am a regular at sunsets (usually a few folks out) and sunrises (never crowded). Guess that is one reason I like sunrises so much. It gives me some time to think. What better way to set the tone for the day and to be thankful for whatever the day brings. This deck ritual has become one of my daily routines here on the ship. Others include food, attempts at sleep, performing Ninja style moves to get in and out of the top bunk, and the one phrase we all can’t wait to hear, “ship’s stoooooorrrreee is open!” The ship’s store is a small closet stocked with all the essentials of life at sea — canned nuts, toiletries, and clothing for the discriminating (ship t-shirts, socks, patches, and hats). And as important as the goods are, the store is also the best source of change – for the quarters and dollar bills necessary to get sodas, candy, and chips from the vending machines. These provisions are the staple of late night science-at-sea when samples are brought on board. Night before last I went out on the bow after dark. We were advised to let someone know if you go out on deck after dark as they keep lights to a minimum to make it easier for those on watch on the bridge to see the ocean and horizon. And indeed, when you first go out, it is really dark. But the moon was bright and my eyes soon adjusted. I laid down on what seems to be the favorite perching spot on the ship — a large “box” covered in lines used in docking. It was incredibly peaceful. I found myself watching clouds passing in front of the moon. Thoughts of woods and waterways back home drifted into my head. I started looking at the sky, at how bright Jupiter is, even with the bright moon sharing the sky. I watched the clouds change color as they passed in front of the moon. Then I noticed one of the clouds had a strong resemblance to a Squat Lobster and the ocean wave patterns reminded me of the swirls of icing on the carrot cake. Hmmm, perhaps I have been on the ship too long…. This crinoid is one of the free-swimming species called comatulids. Photo by Art Howard. Crinoids, also known as sea lilies or feather-stars, are marine echinoderms of the class Crinoidea. The name comes from Greek for “lily-like” in reference to their resemblance to a flower. They have a cup-shaped body (called a theca) with five or more feathery arms (rays) and, in some species, a segmented stalk for attachment to a surface. Theca and rays are together called the crown. The arms contain reproductive organs and sensory tube feet. Most of the body consists of an endoskeleton made up mainly of articulated series of calcareous pieces (ossicles) held together by connective tissues. 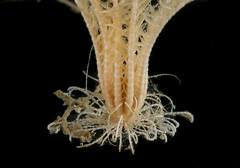 Crinoid cirri act as tiny feet that help the animal cling to substrates. Photo by Mike Dunn. 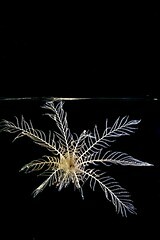 The majority of living crinoids are free-swimming and have only a vestigial stalk. The one we caught was one of the free-swimming species, known as comatulid crinoids. They swim by flapping their arms. They also have small curved “feet” called cirri that they use for movement. Once the animal finds a suitable perch, it uses its cirri to hold itself in place. Looking down into the body of a crinoid. Photo by R. Peyton Hale. 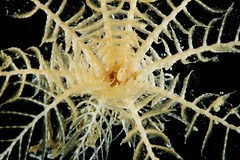 Crinoids are filter feeders. The tube feet are covered with a sticky mucous that traps tiny bits of organic matter suspended in the water. The food is then transported inward, down the length of the arms to the mouth. There are only a few hundred known modern forms, but crinoids were much more numerous both in species and numbers in the past.